This adjustable support is designed to solidly support your deck. It facilitates the levelling of the floor during construction or its adjustment following ground movements (freezing, thawing). A reliable and efficient solution, its steel fabrication gives it a high resistance and solidity. It is installed in a block or a concrete sonotube. Completely reversible: tip the base 180 degrees. The simplest and most efficient way to support a patio, tool shed or deck without needing to dig or pour concrete. Quick installation with a lever. Adjust the head to facilitate installation or add an extension to insert it deeper. Its steel structure, with a baked powder coating finish and its spiral disk ensure stability. This modern technology can be used in all types of terrain and resists ground movements (freezing, thawing). Ground Spike Adjustable Spytek 178-Fits 1 7/8 Inch. Round Post is rated 4.0 out of 5 by 3. Rated 2 out of 5 by Gareth from Wobbly Quick install but post wobbles. Great for fast install. Postwobbles due to slack between the post and the spike. Rated 5 out of 5 by Bocknobby from Great for backyard projects! I was looking for a sturdy and simple way to erect a pole to support a platform bird feeder and did not want to use a Sono tube or other system to anchor a pole. 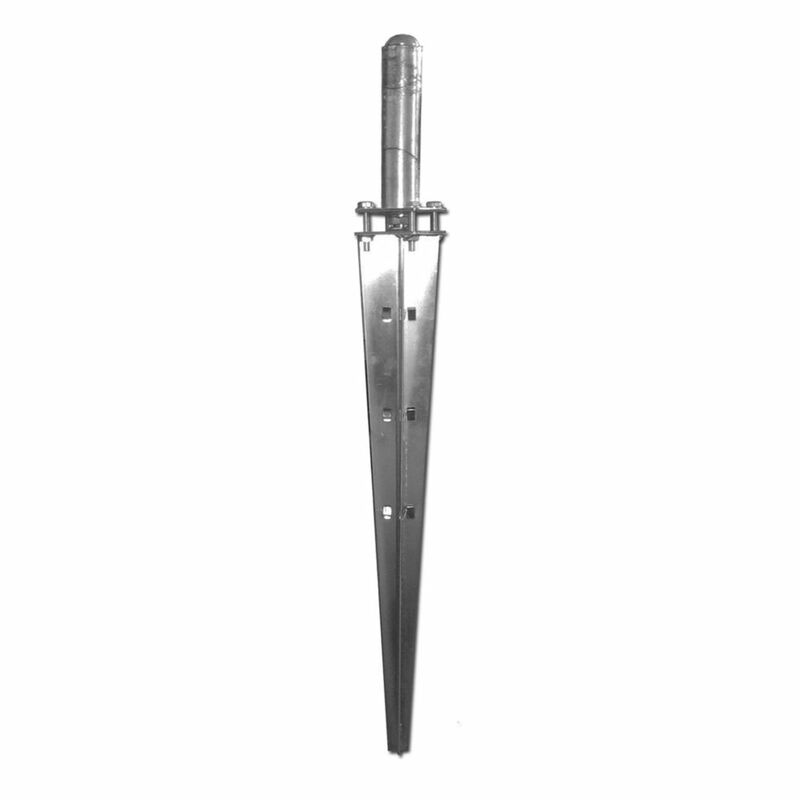 This ground spike, designed to support end posts and gate posts of galvanized fencing, is perfect and comes in different diameters. It is also fully adjustable so the pole is vertical even if the anchor is slightly askew from driving it into the ground. I have used both metal pipe and PVC with success. It is relatively easy to relocate the ground spike, certainly easier than excavating a cement anchor. Rated 5 out of 5 by Bocknobby from Robust and fully adjustable I was looking for some way to secure a metal pole to support a platform bird feeder and this ground spike was exactly what I needed! I was surprised at the size as I was expecting something smaller . . . as a result, it is long enough to support a post that is approximately one-and-a-half meters tall, with a large platform feeder on top! Vertical adjustment is possible with four bolts, and another bolt ensures the spike is firmly set inside the pole. Makes erecting a bird feeder pole exceptionally easy!